The Camden County Prosecutor’s Office and several law enforcement partners are seeking the public’s assistance in locating a Gloucester Township man believed to be responsible for two bank robberies. 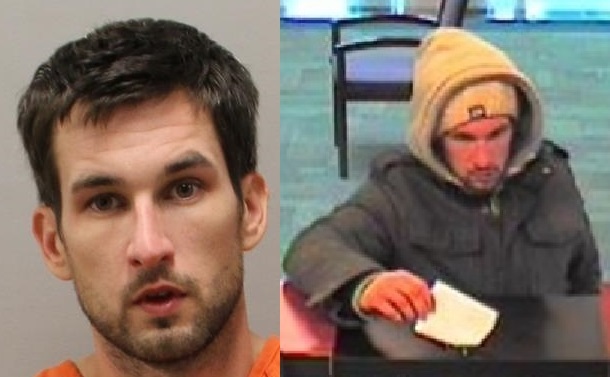 Michael P. Taggart Jr., M/28, is accused of robbing the Beneficial Bank located at 483 Cross Keys Road in Gloucester Township shortly before 10 a.m. February 10. He is also believed to be the same man who robbed the Susquehanna Bank located at 305 South White Horse Pike in Lawnside shortly before 2:30 p.m. Tuesday. In both robberies, the suspect passed a demand note to a teller and fled on foot with an undisclosed amount of cash. Taggart is charged with two counts of Robbery. Taggart stands about 5-foot-7 and weighs approximately 155 pounds. He has brown hair and dark facial hair. The public should not attempt to apprehend this suspect, but rather call 911 immediately if he is encountered. Anyone with additional information regarding Taggart or his whereabouts is urged to contact the Camden County Prosecutor’s Office Major Crimes Unit at (856) 225-8681, Gloucester Township Police at (856) 228-4500, Lawnside Police at (856) 573-6205 or the Federal Bureau of Investigation – South Jersey office at (856) 795-9556. Released Wednesday, February 18, 2015.